I like the way words, phrases, sentences, and paragraphs are arranged in a way that captures the mind of a reader and absorbs his imagination into the world of the book. Rose's notes: This brought a smile to my face today. 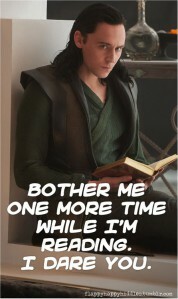 Of course Loki + book would equal perfection.